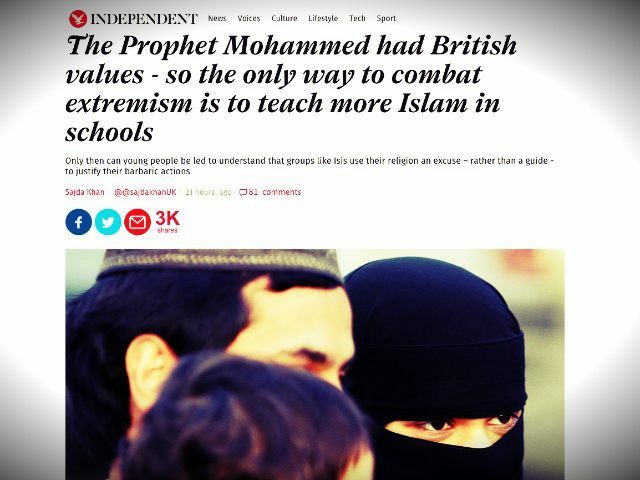 The Independent newspaper has published an article claiming that more Islam should be taught in schools because the Islamic prophet, Muhammed, had “British values”. The article is written by a PhD student who claims she has “a lot” of “respect” for a leading UK Muslim Brotherhood activist. The author, Sajda Khan, used to write for the Huffington Post, though many of her articles – all propaganda pieces about Islam – have now been “removed at the request of the author”. Ms. Khan – who once slammed UK think tank Civitas for attacking the idea of “jihad” – also has a different name to the one listed on her Huffington Post profile from 2012. Simply put, the way to combat Islamic extremism is to invest in real Islamic teaching in British schools: teaching that proves the Prophet Mohammed would never have condoned their actions. Many reading this will find it difficult to stomach, but the Prophet Mohammed had British values. Those values of democracy, the rule of law, individual liberty, mutual respect, and tolerance of those of different faiths and beliefs that schools are now required to promote are inherently Islamic. Violent extremism needs to be rooted out, but we cannot win a war by silencing people. People should be able to hold differing views as long as they do not break the law and live in harmony with others. There is a danger that the proposed tougher legislation will be carte blanche to criminalise law-abiding people. What we need as a society is a common language, common principles and dialogue. Her comments appear to be a claim that Muslims can live in Britain and contribute to society while not agreeing with traditional British values, although she also makes the claim in the Telegraph: “British values as defined by our home secretary Theresa May – such as democracy and the rule of law, tolerance and acceptance of different faiths – are inherently Muslim values too”. This is a golden opportunity to develop within our schools a curriculum based upon the biography of Prophet Muhammad, which clearly demonstrates and embeds British values… Investing in a theological education that teaches the real tenants of Islam is the only way we can genuinely win over those who have turned to extremism – whether we like it or not. She appears to have been referring to the “Is Islam the cause or solution to extremism” debate, hosted by the Islamic Education and Research Academy (iERA) – an organisation led by Hamza Tzortzis, who has previously affirmed his commitment to beheading for those who fought against Muslim interests. IERA has listed among its advisers two preachers banned from the UK for extremist views, and Tzortzis was recently publicly shamed after his name and e-mail address appeared on the Ashley Madison affair website hack list. When told by Al Tikriti that the video of the debate would be available soon, Ms. Khan replied, “jazakAllahkhayrn [May Allah Bless You] Anas, look forward to it. Please keep me informed”.